.... mocking the Samoa Observer. SAVEA SANO MALIFA'S reply to a dreary moan against the Samoa Observer by Samoan PM Tuilaepa: Priceless. Watchdog ... Savea Sano Malifa. Still, I want to say I apologize unequivocally for all the idiotic mistakes you see in the paper day after day. Honestly I have no excuses to offer. 1. Lower the VAGST on newsprint, film, plates, computers, cameras and voice recorders from 15% to 5%, as it is the case in other Pacific Island countries, where all newspapers are considered an educational necessity. "Lapdog" ... Tupuola Terry Tavita. At the time, we had a policy – we still have it – that no reporter conducting an interview at any function – public or otherwise - helped himself to food and drinks if such were served. God bless you too, Tuilaepa. 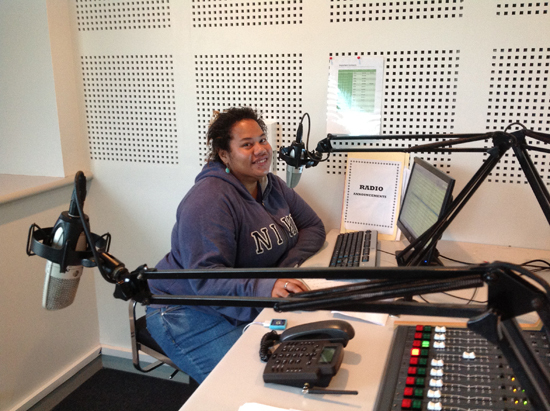 Over the past decade or more, Fiji along with the wider Pacific – and indeed the world – has seen a change in the media environment. Apart from government regulation there has been corporate encroachment, ethical lapses and a failure to serve the public in whose interests we should have been working. The news media in general has embraced commercialism at the expense of journalism; the independence of newsrooms from the commercial arms and activities of their companies has become suspect. The mainstream print media in particular, with relatively vast resources at their disposable, has failed to consistently and properly carry out its public service duty. They have failed to maintain integrity, balance and accuracy. Failed to tell people what they need to know, as opposed to the fluff the media thinks they ought to know. Infotainment has overcome news analysis. Certain media outlets have blatantly sided with one side or the other of vested interests in their news reporting. The profession of journalism, once an honourable and respected calling, has taken a tumble in the eyes of many. As journalists, we have sometimes easily been swayed, letting the baggage of our biases, political leanings, provincialism, racism and sometimes our open support for political parties and actors, get in the way of good, honest journalism. We must regain the vibrancy, excitement, the passion, the truth-telling and – probably even some of the gung-ho attitude – that were once the hallmarks of some of Fiji and the Pacific great journalists such as the late Robert Keith-Reid. That’s why we’ve created Repúblika. Over the past six months, the team at Republika has worked on putting together a publication whose time has come. We have been blessed to have had the unconditional support of family, friends and colleagues – and all those who contributed without hesitation to the first edition. In the week since we have launched, we have had several questions about how the project is being funded. Whoever is interested in finding the answer to that question is welcome to pursue it. I can confirm that there are no big corporate interests behind Repúblika. 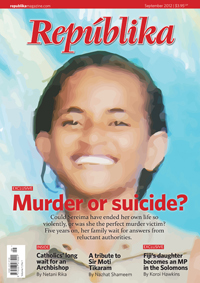 The creation of Repúblika has been pure sweat, tears and sleepless nights to assemble a magazine that captures pressing issues that affect Fiji and the region today. What we may lack in finances and resources is more than made up for in passion, drive and determination and a belief in our dreams. For too often, the media has insulted the intelligence of its audiences by delivering content that’s been passed off as journalism but has involved nothing more than ripping articles off the internet. This is something we will change. Through the public’s support we will be able to produce journalism that jumps. For Repúblika, content is king and our editorial independence is important to us. We are less gloss and more substance. It may seem idealistic, and whatever the practice may be, the bottom line is that as journalists we serve the public interest first and foremost. When we conceal or confuse issues for the public, we fail in that duty. Our entry into the market has been described as triggering a “magazine war”, which is nonsense and baseless. The established magazines have their own approaches and audiences but a wide gap currently exists in the market with nobody willing to take on what’s perceived to be a sensitive and difficult market – current affairs, corruption and politics, without the propaganda. Repúblika will bring back investigative journalism, ask the hard questions without fear or favour, on issues of current affairs, corruption or politics. Politics affects all of our lives every day, whether we like it or not, so we might as well discuss it. And with a new constitution in the making, it is an even better time to document the course of Fiji’s political development. We at Repúblika wish to acknowledge the members of the public who have given us their blessings and whole-hearted support. We have come into existence to serve the public and we will only be able to survive with the support of the public. We also urge our journalist colleagues to rally around us and work with us to bring back honour and integrity into our profession. We aim to regain some of the vibrancy of a free media, to act as a mirror on society without fear or favour. 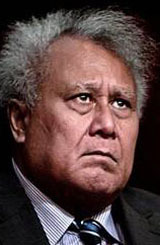 The Pacific – and Fiji – has not been immune to the ethical lapses that have been all too common in recent years in media establishments around the world so we anticipate being held to the same high standards we expect of our leaders and those we criticise. Repúblika also recognises the inextricable link we share as Oceanians. We will explain Fiji to Oceania and explain Pasifika to Fijians. We are independent, we aim to be informative and we will inspire you. Café Pacific says good luck Ricardo. And now the challenge is really on to deliver on the promises. Round two of the FijiVillage.com "no self-censorship" pats on the back. IF ROBUST debate is lacking in the Fiji media, there was certainly plenty of it at the Media and Democracy Symposium hosted at the University of the South Pacific. 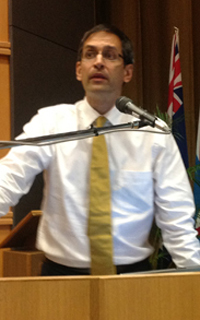 In the aftermath, award-winning Communications Fiji news director Vijay Narayan criticised conference organiser Dr Marc Edge, head of the USP journalism school, for asserting there is a practice of self-censorship in Fiji media – without providing proof from a specific study. 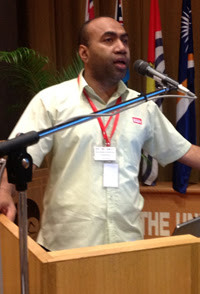 Indeed, Narayan was one of those vocal journalists at last week's conference who defended the Fiji media’s performance. Narayan had said no one from his organisation was threatened or taken to the barracks. He said that since the lifting of the Public Emergency Regulation in January (which included strict censorship), his media organisation had not consulted the Ministry of Information before publishing. “We have never called them [Ministry of Information] after the PER was lifted because we are comfortable about our decisions. We have never been taken to the camp, we have never appeared before the media tribunal,” he said, adding that “some people want to be heroes”. He added that people like Naidu had not been in a newsroom and didn’t know what it was like. Naidu retorted: “I worked in a newsroom – you can’t tell me I don’t know. If your organisation hasn’t gone to court I don’t think it’s doing its job. Earlier in the panel discussion, representatives from the Fiji Sun and Fiji TV had told their stories of operating under censorship, before the lifting of the PER. 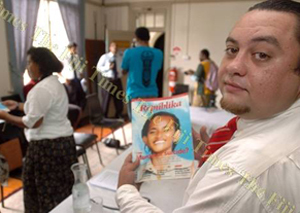 Josua Tuwere, deputy editor of the Fiji Sun, said censorship had been a good thing for them.“It made us better journalists – we were forced to think about the repercussions of what we write,” he said. While Tuwere said censorship was “all civil, no one was threatened ever”, Fiji TV’s legal manager, Tanya Waqanika, had a different experience. “We had our fair share of detention, fair share of threats,” she said. She said Fiji TV operated under censorship by consulting with the Ministry of Information and obtaining prior permission for a story to avoid a backlash once it was broadcast. She said it involved the ministry disallowing vital stories such as one on the Sigatoka hospital running out of water. And even though the PER has been lifted, and Fiji TV was operating under a “business as usual” approach, it still consulted the government this year before running an advertisement from a client which featured brief footage of military men with guns. She also said journalists were still afraid, and apprehensive to ask the questions they would normally ask. “The journalists, they see the penalties. If you were in that situation, and there’s a court case currently against The Fiji Times, for any person, it freaks them out,” she said. It resonates with Naidu’s claim it was of no impact that the decree had not been used against a journalist. He said the threat of the fines were penal enough – a journalist can be fined up to F$50,000 without the right to appeal. (The media decree provides penalties of $100,000 for media organisations, $25,000 for publishers and editors and $1000 for individual journalists). Naidu described the six-month extension of Fiji TV’s licence “more like a good behaviour bond than a licence” while Waqanika said: “We just have to play it safe” and “We have to make a business decision”. Now Narayan might be able to defend Communications Fiji and its website FijiVillage, and he is correct in his assertion that there has been no specific study on FijiVillage’s reporting, but perhaps he was ignoring the elephant in the room after hearing from Tuwere and Waqanika. His organisation has published an update yesterday on the self-censorship debate. Narayan and fellow journalists Dhanjay Deo and Sarah Vamarasi claim there is no self-censorship, after "checking" with Fiji Times editor Fred Wesley and Fiji Sun publisher Peter Lomas, and their own editors. That is hardly an academic study. They also say Fiji TV says it will not comment. How they would have handled an honest answer may have been interesting. This writer is undertaking a study into the print media in Fiji and other Pacific countries and there is extensive evidence that due to censorship, the print media in Fiji is suffering from self-censorship, as they are not sure where the line will be drawn by the government. As Richard Naidu pointed out, the Media Industry Development Decree is full of subjective tests. “What is and who decides what is against public order? What is and who decides what is against the public interest?” he said, referring to the decree’s punishments of fines and jail terms for those that fail to pass the test. The Permanent Secretary for Information Sharon Smith-Johns, to her credit, presented and sat through the whole two-day symposium, and was willing to be interviewed by any media or student journalist. She gave me a small insight into where the government’s line might be. She recognised it “would only be natural to have caution” for journalists coming out of censorship, but said: “Come out, there’s no need to be afraid”. “It’s like all of us – the laws are only there for when you or I break them. And the chances of you or me ever breaking the law, apart from a speeding ticket or fine, it’s never going to happen because we know how to behave because we know what’s right. “And so journalists know what’s right as well. But certainly more than that one percent feel intimidated. And what is it that the one percent are prone to publish against “social harmony”? Smith-Johns said journalists need to “embrace what the next step is” but at least publicly, she hasn’t shone too bright a light on that area between the next step and the abyss should they step too far. 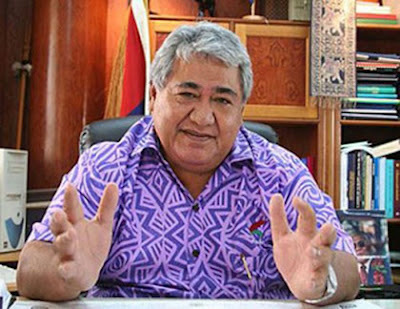 Tuwere from the Fiji Sun agreed – he said the media “were irresponsible in their reporting, especially on issues of race”. Perhaps if journalists steer clear of racial invective, which is the right thing to do anyway, they can get away with much more than they are currently attempting regarding analysis and criticism of the government. At the symposium, a former head of journalism at USP, Shailendra Singh, said it was certainly not a “cut and dried” issue as some would like to make out. Perhaps this is not only a time to be more circumspect, but more courageous. But that’s easy for me to say, writing from New Zealand. As an example, Smith-Johns referred to the recent accusations of self-censorship levelled at newspapers by Shamima Ali, coordinator of the Women’s Crisis Centre. Smith-Johns argued that when publishers did not run Ali’s advertisement they were not under any government directive and they made their own decision, probably based on readers’ tastes. She said there was a lot of “irrelevant” information in the release despite the fact the women’s groups had a lot of good things to say. “I would have preferred that ad to run because it was quite silly in a lot of ways and quite defendable from our point of view,” she said. So Smith-Johns and the government are happy for the papers to run “silly” press releases, as people can make their own minds up. It seems, however, that they don’t trust people making their minds up about some other issues, hence the decree and its fines for those that “push it to the limit”. From what we saw at the Media and Democracy Symposium – and the reporting of it in the press the next day – there are not a lot of limits being pushed. Alex Perrottet is contributing editor for Pacific Media Watch, a masters student at AUT University researching comparative journalism in three Pacific countries and was at the Media and Democracy conference in Fiji. He also has a law degree. Robert Hackett speaking at a recent seminar at Fairhaven College, WWU on Vimeo. USP media and democracy video coming soon. RAMPANT SELF-CENSORSHIP in action? 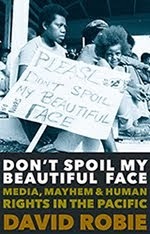 It was astonishing to see a Media and Democracy symposium at the University of the South Pacific – which raised the tempo of “quality” journalism debate in post-coup Fiji by quantum leaps – being ignored over substantive issues while the regime’s chief media official was splashed across both daily front pages. Keynote speaker Professor Robert Hackett, a world-renowned Canadian authority on peace journalism and “alternative” journalism models, was not even reported. Instead, the news was Permanent Secretary for Information Sharon Smith-Johns saying “rise to the challenge” and take advantage of the lifting of censorship. But while the local media duly splashed this message, few local journalists actually engaged with the challenging ideas canvased at the conference. 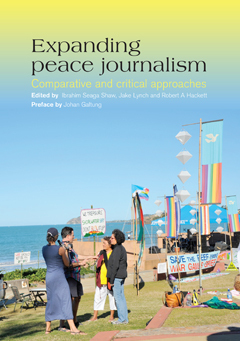 Speaking to some of the young journos on hand, Café Pacific certainly had the impression that they were not experienced enough or well-equipped to cope with fundamental questions challenging the news media. Countries as diverse as Britain, Australia and New Zealand are pre-occupied with rebuilding public trust in the media – and strategies for doing this - in the wake of the Leveson Inquiry triggered by the “hackgate” scandal that closed Murdoch’s big-selling tabloid News of the World and has led to prosecutions of several journalists and media personalities. But the local Fiji journalists seemed immune from this and not familiar with global debates about the future of journalism. 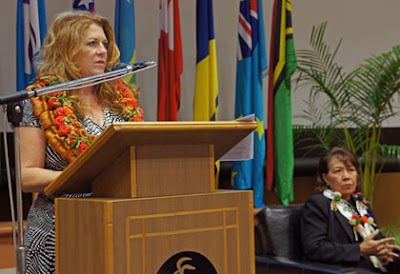 A critical conference opening speech by USP Deputy Vice-Chancellor Esther Williams savaged the Fiji media (front page in the journalism student newspaper Wansolwara), complaining about reports “riddled with editorial mistakes”, drew defensive retorts from local scribes. Yet the interesting research and analysis about Fiji and Pacific media presented at the symposium was covered in a very superficial manner, if reported at all. Fiji Television produced an atrocious Close-Up programme about the symposium by Myron Williams - not in the same class of the Geoffrey Smith special report about the Pacific Media Summit run by PINA earlier this year. Even Radio Australia and Radio NZ International (usually reliable) failed their audience on coverage. Readers need to go to Pacific Scoop or Pacific Media Watch for independent and informed and reportage. The most insightful preliminary article was actually an offshore blog column on Grubsheet by Fiji-born journalist Graham Davis who wasn't actually even there (and should have been invited). While this mainly dealt with behind-the-scenes tensions leading into the conference, it at least raised some of the core philosophical issues facing the future of regional media. 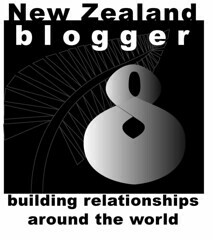 Such issues included what models of journalism might be best suited for Fiji and the Pacific – an unbridled “publish and be damned” Anglo-American approach, or something more subtle but equally robust such as a range of journalism models grouped under the label “deliberative journalism”. 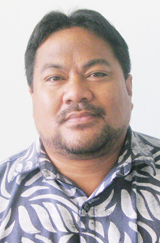 “Deliberative” models – as deconstructed by the Pacific Media Centre’s Professor David Robie, are essentially those more suited to citizen empowerment for a better democracy – include those such as public journalism, alternative journalism, critical development journalism, peace journalism and human rights journalism. None of these models are “soft” or core journalism values, but add a wider range of skills as well. 1. Market liberalism – the “free market” model in Fiji (as it used to be) shared with Australia and NZ: “Democracy is seen not as an end in itself, but as normally the best institutional arrangement to maintain political stability and a liberal political culture characterised by individual rights and choice.” The media serves as a watchdog on government power. 2. “Public sphere” liberalism – “prioritises the role of the media in facilitating or even constituting a public sphere so that public opinion can be formed”. The independent watchdog role continues, but a higher value is placed on popular participation. 3. “Radical democracy” and a political economy critique – “radical democrats seek not to just reinvigorate an existing system of representative democracy, or to ensure quality of legal and political rights for everybody. They also prize direct participation by people in making the decisions that affect their lives and approximate equality in wealth and power.” The watchdog media role is endorsed, but greater emphasis is placed on social change and popular mobilisation against social injustices. During the conference, the excellent new USP documentary on media freedom in the Pacific, made in association with the International Federation of Journalists (and directed by Don Pollock), was also screened. And there were feisty debates about media freedom and journalism education. 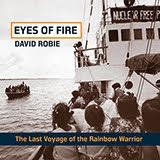 Stop press: Current USP head Dr Marc Edge has again misrepresented David Robie in his Fiji media wars blog. What was actually said about Pacific journalism education and standards at the USP symposium is reported here. 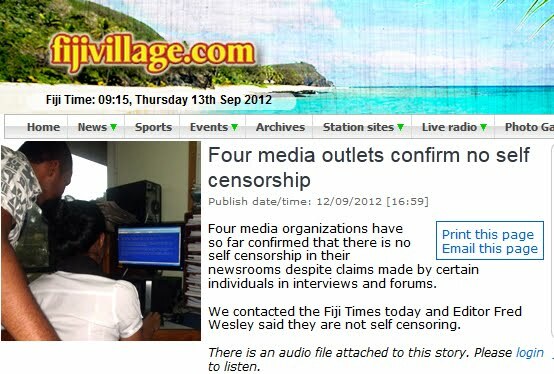 Edge has also been blasted by the FijiVillage news team over his self-censorship claims. The local media partially redeemed itself a week later with the Fiji Sun republishing a symposium overview by the Pacific Media Centre team on Pacific Scoop and the Fiji Times running a short (900 word) extract from David Robie's 8400 word paper about "deliberative" journalism and media models. Perhaps they read this blog? But Café Pacific wonders why no local scribes present at the conference produced a reflective overview article.